An aurora is a natural display of light in the sky that can be seen with the unaided eye only at night. An auroral display in the Northern Hemisphere is called the aurora borealis, or the northern lights. 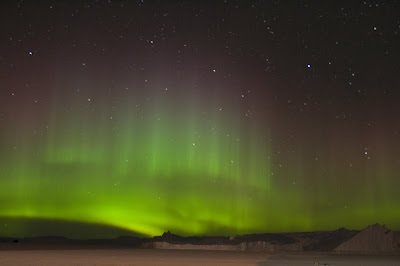 A similar phenomenon in the Southern Hemisphere is called the aurora australis. Auroras are the most visible effect of the sun's activity on the earth's atmosphere. 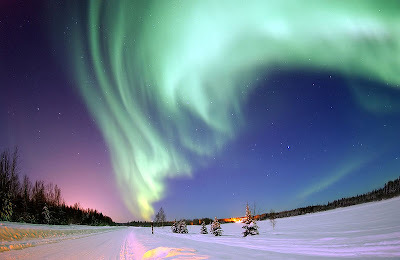 Most auroras occur in far northern and southern regions. They appear chiefly as arcs, clouds, and streaks. Some move, brighten, or flicker suddenly. The most common color in an aurora is green. But displays that occur extremely high in the sky may be red or purple. Most auroras occur about 60 to 620 miles (97 to 1,000 kilometers) above the earth. Some extend lengthwise across the sky for thousands of miles or kilometers. In Bill Bryson's travel memoir Neither Here Nor There, he begins his journey in Hammerfest, Norway, "the northernmost point of the European mainland", with the hopes of witnessing the spectacular display of the Northern Lights. He describes Hammerfest as a quaint and quiet little town where not much happens. He becomes a regular at the local coffee shop and hotel bar and spends most of his time waiting for the magical lightshow to appear. Eventually, more than two weeks in he gets his wish. I think his descriptions of Hammerfest totally intriguing. I finally googled some images of the city (shown above) and was rather shocked to find it so picturesque. I guess that shouldn't surprise me as the Scandinavian countries are known being pretty nice, huh. I like the idea of escaping anonymously for a month to a place where, after a while, your routine makes you feel like a native rather than a stranger. Can you add the good copyright with this picture ? "Picture : © Samuel Blanc / www.sblanc.com"
with an actif link to my website ? Otherwise it's an illegal use ! Sure, thing Samuel. Sorry about that! I didn't know where they came from, but they were lovely photos. No problem, you can delete my comment is not important in your blog.